You may remember I mentioned about the outstanding Egyptian diggers for my Pyramids of Mars Doctor Who scenario? I bought them at Salute and Westwind promised to post them for free. Well, they arrived today so I now have all the figures I need. 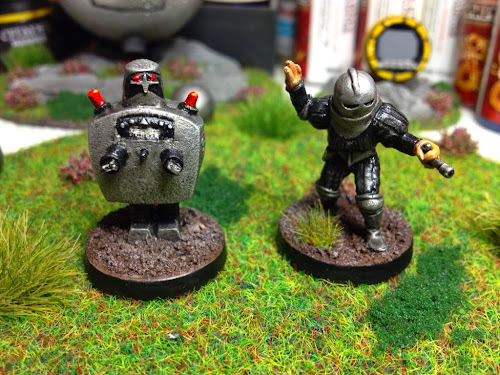 I've finished painting my first two figures for The Sontaran Experiment. Meet Field Major Styre and a servo robot that will be a proxy for the tentacled machine used in the actual show. 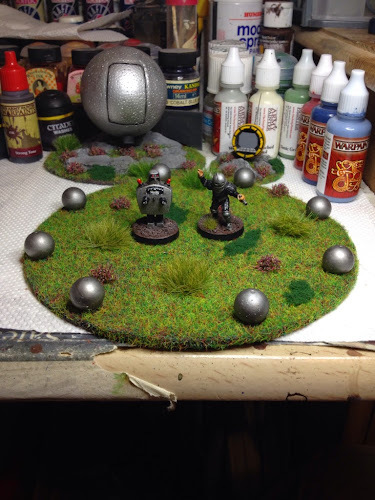 As part of my terrain push earlier this year I put together the Transmat Circle, spaceship and communication module. The spaceship is temporary, it's just a painted polystyrene ball attached to a cocktail stick. I aim to find a Christmas bauble with a mesh pattern and do a better job later in the year. The robot is a bit basic, but will do for now. The figure appears to be based on the servo robot that appeared in The Wheel in Space. I have the figures needed for the good guys: fourth Doctor, Sarah Jane and Harry. I struggled a while finding GalSec prisoners, but in the end settled on the ARC Moonbase Crew by Crooked Dice. They are currently on the painting table, along with a squad of Germans for Bolt Action, but will have to wait until I get my lamp replaced. The warband emerged from the Monastary and gathered their loot. The livestock were frisky and needed careful handling. If too many were assigned to a unit of men it would likely slow their escape. Between the warband and the ship lay wooded country. On one flank was a mist shrouded marsh. Directly ahead the ground was rocky and broken. The mist seemed to have a life of its own, it writhed and glowed with an eery green light. In the distance a shambling mass of bodies emerged from the mist. Their erratic animated forms stumbled forward, driven onwards by the sheer will of their necromatic master. The undead have crawled from their graves! Worse still, they now stand between the warband and the safety of their ship. Mighty Kyle's warlord looked at the landscape before him... He suddenly realised that they had spilt blood on a plain filled with charnel pits. How would they escape? Four units of undead blocked their escape, with each unit composed of 12 undead levy. Although the necromancer could only roll three of the fabled SAGA dice, each of his undead units generated a Dread Token (provided at least 10 levy remained unhewn). Sadly no Dread Tokens arrived in the mystical Revenant Box, so proxies needed to be found. Fortunately the realm of Warhammer came to the rescue and suitable trinkets were found. By collecting Dread Tokens, the necromancer could expand on his magical abilities. In times of need he could use them to roll extra dice and even spend them to absorb wounds. The necromancer examined his Battle Board and found a spell to instill fear into his foe. Fortunately for the Anglo Danes, the Revenants shuffling movement was limited to S. More SAGA dice and Dread Tokens were needed to increase the rate of their advance. It was time for the Anglo Danes to roll the dice and face their fate. Hoping to slow the advance of the undead, the Anglo Dane warlord unleashed his dice and several of the undead were TRAPPED. But since they were already dead, the Revenants could not be exhausted. Although they acquired fatigue, their advance could not be stopped. In combat the fatigue could be used to eliminate individual corpses, but they would first have to be engaged in melee. Perhaps the levy slingers of doom could stop the advance? Overcoming their fear, the levy unloaded their slings, but only a single corpse fell. Unbeknown to the Anglo Danes, Revenants do not feel pain and with an armour save of 5, they proved difficult to kill with missiles. Close combat would be needed! Their stones spent, the levy stood firm. But ahead of them the undead rattled onwards. The shambling mass of decay fell upon the Anglo Dane slingers. Rancid nails clawed at living flesh. The levy fought bravely but the undead prevailed. Unfortunately a strange flux in the mist meant that the Anglo Dane levy could not fall back. Behind them stood their own hearthguard blocking their escape. If they moved they would find some of their unit too close to their foe (ie within VS), so they stood their ground and the Revenants were forced to withdraw. A unit of Anglo Dane warriors lowered their spears and charged, falling upon an undead unit on the left flank. Undead limbs were hewn, but red blood was also spilt. Although only two warriors remained standing, the undead were forced back. The necromancer reviewed his front line. Previously animated corpses lay rent on the ground. But only the living die! Casting dice and reviewing the battle board it was time to raise the fallen. Add three models (six with the Dread token) to existing units. Yes plural - units! 'What?!' Came the cry from an anguished Mighty Kyle. The dead returned to the battlefield. Axes were sharpened and with a fully loaded battle board an eight man unit of Anglo Dane hearthguard charged into the fray. With Dane Axes flying, all Mighty Kyle needed with his 21 dice was a roll of 2 or more. The Revenant unit was no more. The dead can't rise to join a unit that no longer exists. But the hearthguard were now spent with no battle board abilities to defend them. More Revenants surged forward. As the dust settled, the pigs squealed and tried to escape from the single remaining hearthguard. Ten undead were hewn, but would they return? On the opposite flank, foul animated corpses fell upon the remaining warriors. Their outstretched limbs ripping the life from the living. The forces of darkness could not be stopped. How would Mighty Kyle's Anglo Danes escape? Close scrutiny of the battle board was needed! Surveying the scene ahead of him, Mighty Kyle realised that although his right flank was weakened, little stood before his warlord and the necromancer. A plan was hatched and the Anglo Dane warlord raced towards his foe, hacking two Revenants into pieces before he halted. The warlord was exhausted but stood resolute. He may yet escape with his life! On his left flank another unit of hearthguards still guarded their plunder. Charging forwards they eliminated the undead that stood before them. Only a single unit of Revenants now stood between them and their ship! Was victory within the grasp of Mighty Kyle? The GATES OF HELL were opened and a unit of 12 undead levy clawed their way from the tortured earth. Exhausted, the Anglo Dane warlord was filled with despair and found himself OVERWHELMED. Realising his blasphemy would not go unpunished, the warlord prayed for forgiveness from his god. But the mouths of the ravenous horde were relentless in their hunger and the warlord fell in disgrace. The undead horde then sort out fresh meat and shambled towards the remaining levy. With his Revenants pursuing what remained of the Anglo Dane levy, the necromancer's attention was drawn to the cries of battle as the hearthguard charged. Although they suffered heavy losses, the hearthguard were victorious, eradicating the Revenants that had blocked their flight. Another grave pit lay ahead. Could it be opened in time? The levy were devoured and the nearby warriors fled in panic, with the undead following under their own instincts. But the necromancer was exposed and found himself pursued by Mighty Kyle's now rested hearthguard. With less than 10 Revenants left standing, the undead unit could not generate a Dread Token. Although the necromancer still rolled three dice, he could not open the grave so retreated. Perhaps the hearthguard could be stopped with a blast of magic? Too late, the necromancer realised he was out of time and luck. The hearthguard threw in everything they had and the necromancer fell. Wow this was a game and half. There is no turn limit in the scenario and we went on for more than 3 hours! In this scenario, the Revenants simply need to kill their opponents, gaining slaughtering points for each model removed from play. The Monastary raiders must escape with their ill gotten gains. Although the Anglo Dane warlord died, the warband could still generate SAGA dice so we continued. Once the necromancer had fallen the Revenants could no longer generate SAGA dice so victory went to Mighty Kyle. If there had been one more undead in the last Revenant unit though, a Dread Token would have been generated. Since Dread Tokens can be exchanged for SAGA dice and used to soak up wounds, it was a very narrow victory indeed. I really enjoyed playing the Revenants and look forward to raising them once again. So what did I come home with? First up freebies in the Salute bag! This year there was the traditional 6 sided die, along with a fire arc template and Renedra plastic Agincourt archer. The Troll Trader had great deals on loads of stuff. It was a bit like battling grannies at a jumble sale! I used the force and was disciplined though, limiting purchases to the three outstanding Scum ships from our X-Wing collection. Just need the Tantive IV now... At more than £50 that will have to wait a while. A quick visit to Warlord Games and I collected my preorder of early war Germans: MMG, HQ and 36mm Pak. Looks like the box included a free Terminator figure as well. Was hoping to get a German armoured car, but they had sold out. No rush on that just yet though, so not a problem. The show deal on Crooked Dice's 7th Voyage was too good to miss! The rules were developed from 7TV which were themselves based on the Doctor Who Miniatures Game. I'm a huge fan of the old stop motion movie classics and after reading Colgar6's battle reports featuring 7th Voyage this was really a no brainer. Kyle and I will be catching up on films over the coming weeks and I'll start thinking about a 'scene' to shoot. Just in case we go Greek (so to speak), I nabbed a few Argonauts. A prior deal on Facebook Oldhammer Trader had me meeting up with a fellow to collect an old Giant Hill Troll, sculpted by non other than the Goblinmaster himself - Kevin Adams! Kevin was at Salute and we popped by his stand to admire some of his recent sculpts. Remember though, I had a list and the force remained strong so I resisted the urge to buy anything. I was going to whip out the troll and show Kevin, but he was eating a sarnie when we passed by and I didn't want to interrupt. I'm sure he was badgered by old duffers like me throughout the day, so he probably wouldn't have appreciated me contaminating his lunch with some old lead! No matter, whilst wandering past the Foundry stall I was hailed by another Oldhammerer! We exchanged pleasantries and I whipped out my troll! To suitable sounds of appreciation of course. I didn't know it at the time, but it turn out this was Orlygg (with his mate Stuart) of Realm of Chaos fame. Anyway, back to the plunder... I did manage to collect the figures needed to complete the Pyramids scenario. I also managed to get the native diggers from Westwind. Unfortunately they didn't have the figures at Salute, but said they'd post them for free. So they should be with me soon. As you can see, I was tempted by a new Doctor from Heresy. I was keen on getting a few, but the force protected me (they're not cheap)! Couldn't resist some alternative Pulp archaeologist figures as well. I had a good old rummage through Gripping Beast's wares and found some items I've been after for a while. Women and children! I also bagged some spare shields. Very useful as loot markers in pillage scenarios or general scenery elements in village based scenarios. I already have some chickens and aim to use them with a small child to create another piece of baggage. I'd like to use one of the women with some geese, but haven't yet managed to find any geese... The beast had some nice longhorn sheep, but since I've just finished painting the soays, I managed to resist. There's the Revenant battle board, rules, dice and a scenario that involves a raiding force fleeing back to their ships after looting a Monastary. Figure wise there are 48 metal undead, a metal necromancer (with groovy base) and two grave markers. The grave markers allow additional Revenant units to enter play. Sounds intriguing! We are looking forward to putting the Revenants through their undead paces later today.